In anticipation of the 2019 grand opening of the McKnight Center for the Performing Arts at Oklahoma State University, the New York Philharmonic’s Carter Brey will join the OSU Symphony Orchestra for a Nov. 1 performance at the Seretean Center on campus. 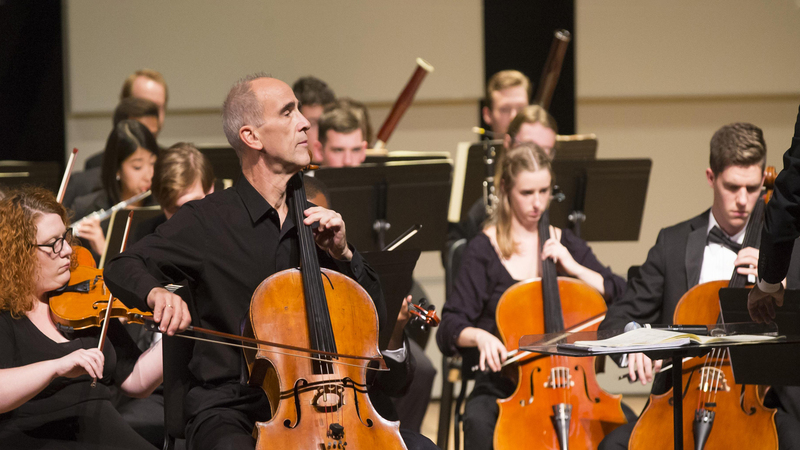 Brey, the principal cellist for the oldest symphony orchestra in the nation, will also lead a Nov. 2 masterclass for OSU cello students. Brey’s performance was planned by the McKnight Center and the Greenwood School of Music as part of a series of events that will crescendo with the Center’s grand opening and inaugural 2019 season. The season begins October 11, 2019 with a week-long residency of the New York Philharmonic. Additional performances and events will be announced in Spring 2019, to include Broadway touring productions and performances by elite orchestras, chamber groups, and individual musicians. The McKnight Center will also provide cutting-edge technology and performance space to OSU music faculty and students while facilitating opportunities for students to learn from and interact with visiting performers.